Since the implementation of the new property cooling measures on the 5th of July, market sentiment has indeed cooled and buyers are starting to become a little more discerning when it comes to the latest new launch. Riverfront Residences opened for sale on the very night of the announcement in reaction to the new property cooling measures. The Tre Ver is currently open for buyers to preview the show units. I am reviewing these two properties together as I believe they hold some distinct similarities. They are both waterfront properties and both are not the nearest development to their nearest respective MRT stations. 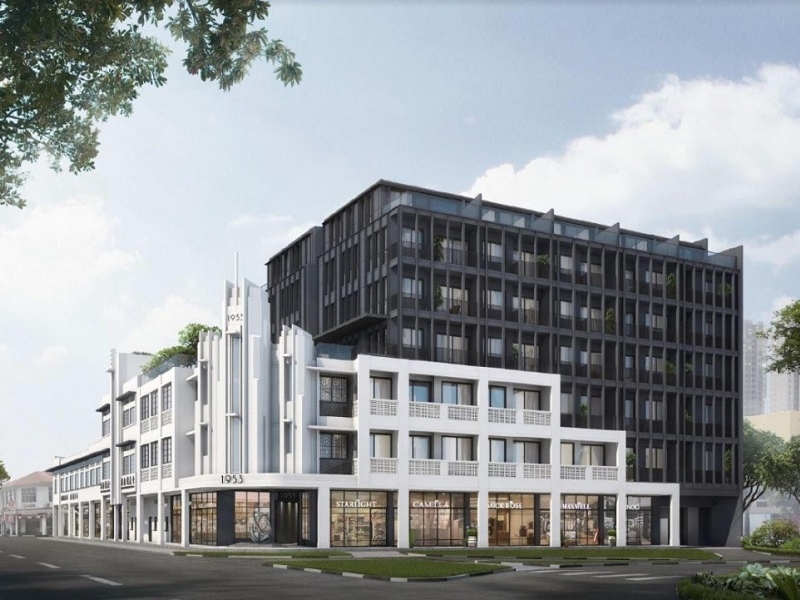 The Tre Ver is a 99-year leasehold development located along Potong Pasir Avenue 1. It is located on the site of Raintree Gardens, a former HUDC estate which underwent privatisation. Back in October 2016, the 175-unit Raintree Garden was sold en bloc to UVD (Projects), a joint venture of UOL Group and United Industrial Corporation. Each owner was paid SGD$1.9 million for their unit. In its place, a 729 unit development called The Tre Ver is to be built on the 201,405 square feet plot of land. The Tre Ver will consist of 3 20-storey tower blocks, 2 19-storey tower blocks, 4 7-storey garden blocks including a 2-storey carpark as well as a basement car park. The project is slated for completion in August 2022. 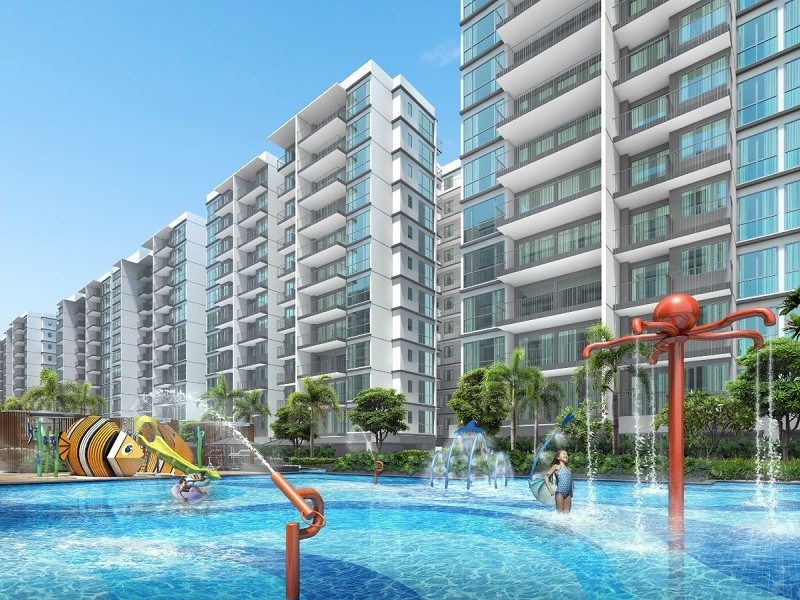 Riverfront Residences is a 99-year leasehold development located along Hougang Avenue 7. It is located on the site of Rio Casa, a former privatised HUDC estate. Rio Casa, a 286 unit development, was sold en bloc for $575 million to a joint venture company, Oxley-Lian Beng Venture. Riverfront Residences will be a joint venture between Oxley Holdings, Lian Beng Group, KSH Development and Apricot Capital. Their stakes in the joint venture are 35%, 20%, 35% and 10% respectively. Each owner of Rio Casa was paid $2 million for their units in the river-fronting estate. The land which the former Rio Casa sits on has a site area of 396,231 square feet. Riverfront Residences is a 1,472 unit residential project with 6 retail shops. The development will consist of usual tower blocks as well as strata terraces. Where are these developments located? The Tre Ver is located along Potong Pasir Avenue 1. It is about 800 meters or a 10-minute walk to the Potong Pasir MRT Station. It is not near the MRT station especially when there are so many other nearer developments like The Poiz Residences and Sennett Residences which are located right next to Potong Pasir MRT Station. The Tre Ver fronts the Kallang River and has a nice, serene park right next to it. 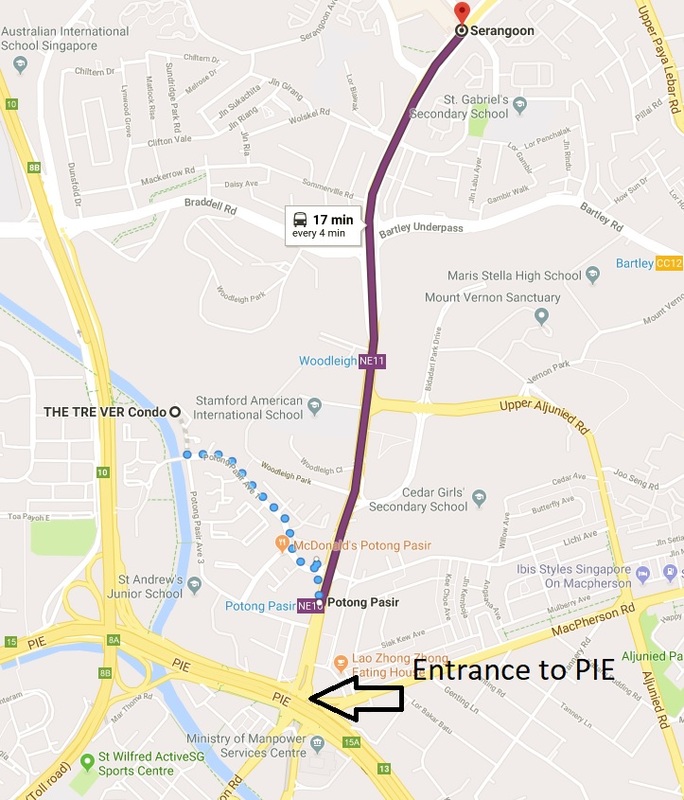 If you are driving, it would take you approximately 5 minutes to get to the entrance of the Pan Island Expressway (PIE). Driving along Upper Serangoon Road towards the direction of Boon Keng and in about 10 to 15 minutes, you will get to Bugis or City Hall. Potong Pasir is also one MRT stop away from the upcoming The Woodleigh Mall which will be a bus interchange. 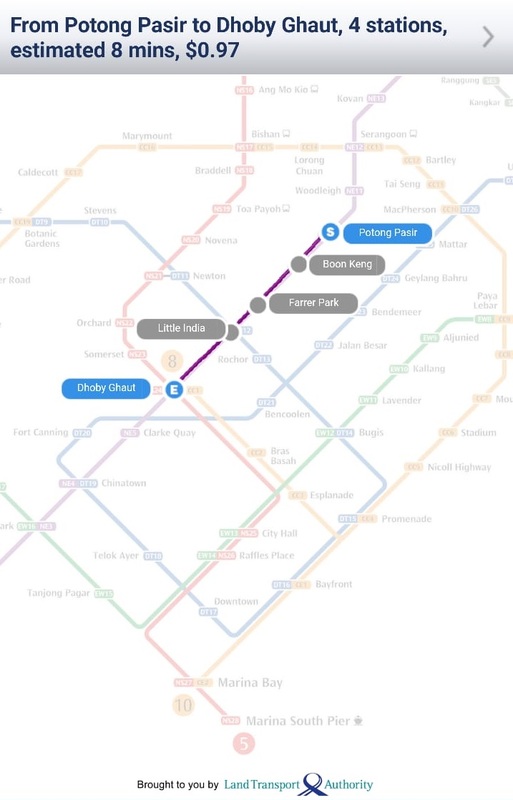 Serangoon MRT Station is two stops away from Potong Pasir MRT Station and from there you can change from the North-East Line (NEL) to the Circle Line. Potong Pasir MRT Station is also 4 stops away from Dhoby Ghaut MRT Station. 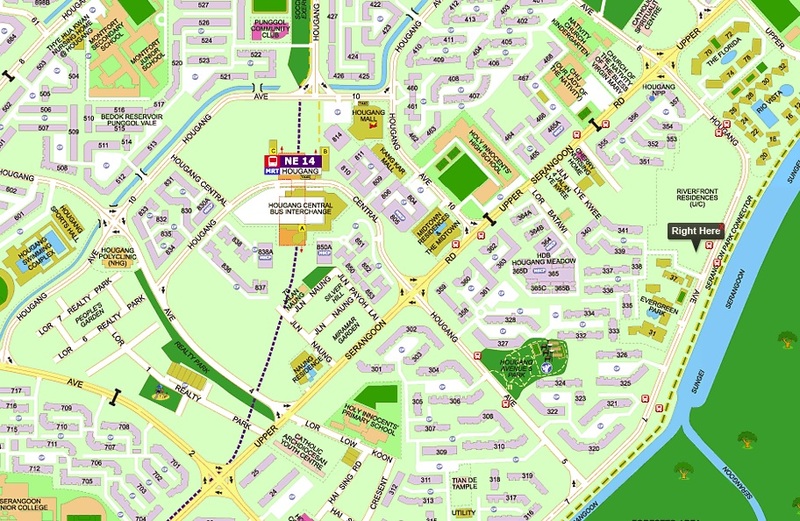 The Tre Ver is located within a 1-kilometre radius of St. Andrew’s Junior School. Thus this may be a reason for some to buy a property here as well. 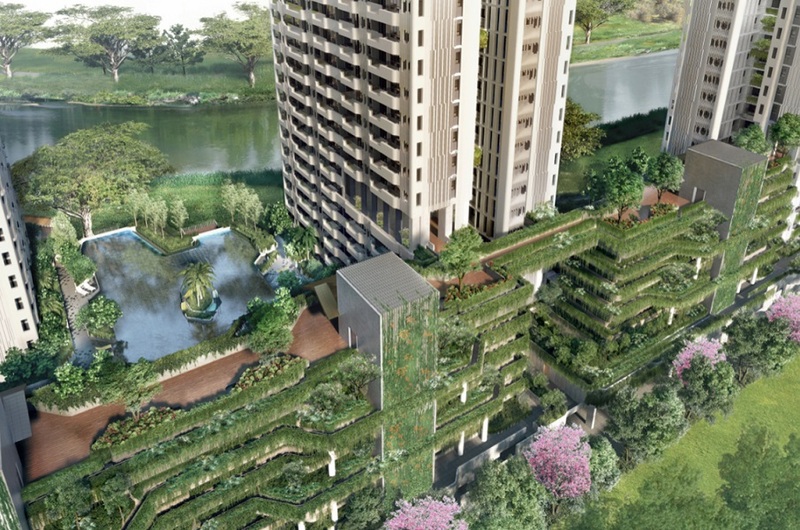 Riverfront Residences is located along Hougang Avenue 7. It will take approximately 14 minutes to walk to Hougang MRT Station according to Google Maps. Although I would think that this distance should be slightly shorter if you were to cut across the HDB blocks. 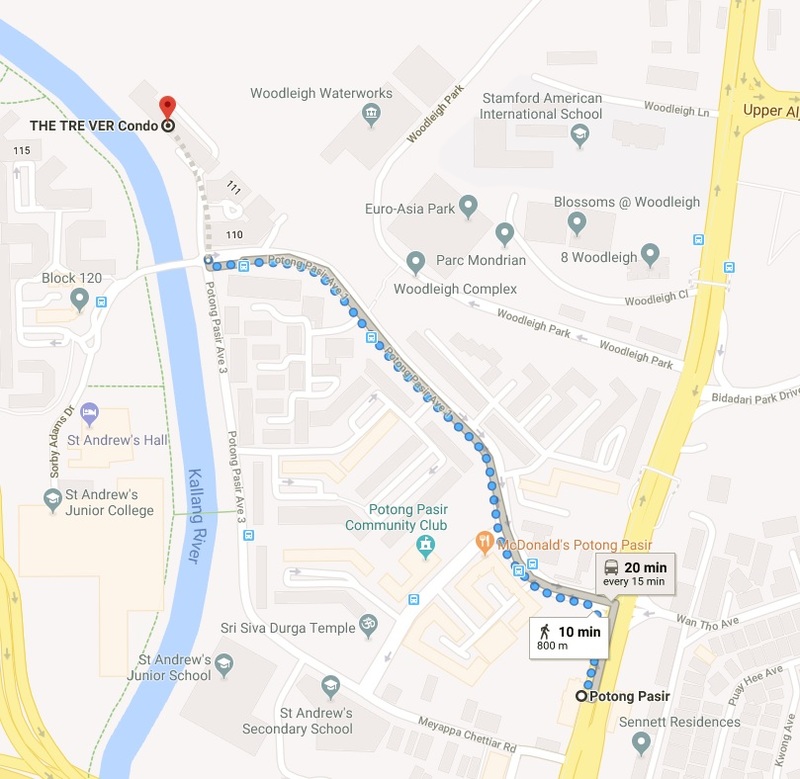 It is approximately a 1-kilometre walk to Hougang MRT Station although it should take you slightly shorter than that to reach Hougang Central. Riverfront Residences fronts the Serangoon River although there is a road separating the development from the riverfront. Punggol Park is nearby and is a very huge park. The entrance to the KPE Expressway is just around the corner. You have to drive towards Sengkang and turn right at Buangkok East Drive to get to the entrance of the KPE. Alternatively, you could enter KPE from Tampines Road. Based on Google Maps, Suntec City is a 16-minute drive from Riverfront Residences. Riverfront Residences is located within 1-kilometre from Holy Innocents’ Primary School and Punggol Primary School. Riverfront Residences to Suntec City. 16-minute drive according to Google Maps. The waterfront facing of both developments is the main selling point in my opinion. To have a waterfront development in Singapore is not common thus I usually put a slight premium on properties that have waterfront facing. If you were purchasing the property for your own stay, these two properties are looking like very nice and serene developments to consider settling down in. 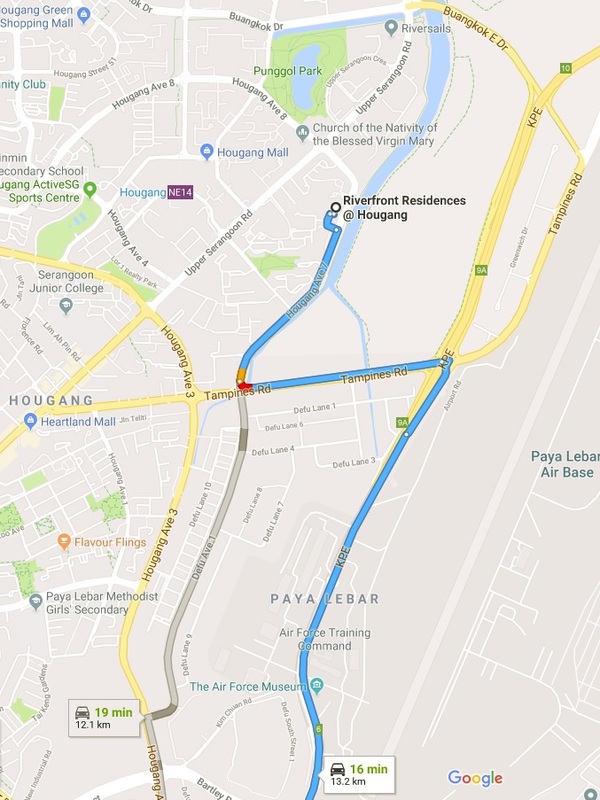 Perhaps the slight edge would have to be given to The Tre Ver as it is directly facing the Kallang River whereas Riverfront Residences and The Serangoon River is split by Hougang Avenue 7. The Tre Ver is developed by UOL Group and UIC, two very reputable companies in Singapore. 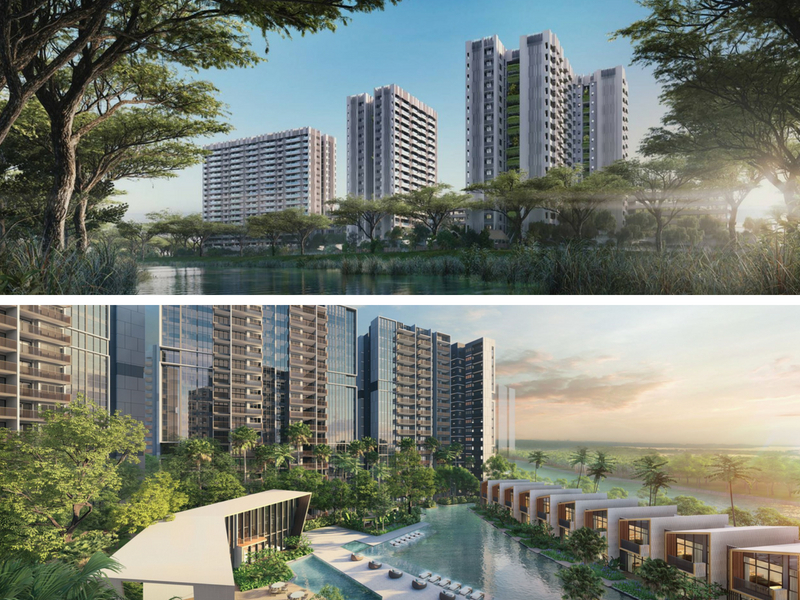 Recent launches by UOL Group include Amber 45 and The Clement Canopy. Other notable developments in their portfolio include Botanique at Bartley, Spottiswoode Residences and Nassim Park Residences. Their commercial property portfolio includes malls like United Square and Novena Square. UOL Group is a very established developer with a very strong track record and their developments are usually well built and maintained. Personally, they are one of my favourite developers. UIC was also involved in The Clement Canopy with OUL and their other developments include V On Shenton, Mon Jervois and Alex Residences. They have been a public listed company since 1969. In terms of developer track record, the developers of The Tre Ver are one of the best out there. Riverfront Residences is developed by Oxley Holdings, Lian Beng Group, KSH Development and Apricot Capital. Oxley is currently the largest developer in Singapore based on unsold units. They have been extremely aggressive in the Singapore development scene and their recent developments include Affinity at Serangoon. Lian Beng Group is one of Singapore’s major home-grown building construction groups. 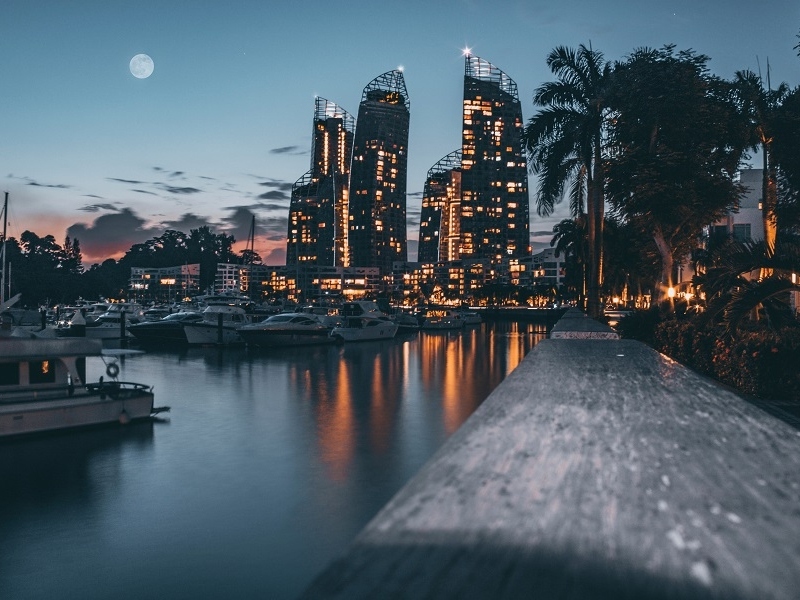 KSH Holdings is a well-established construction, property development and property investment group and has been listed on the Singapore Stock Exchange since 2007. Apricot Capital is the private investment company of the Teo family of the Super Group. In terms of developer profile, Riverfront Residences is also backed by reputable parties. If you are looking for a nice, peaceful environment, then these two developments are for you. Having a waterfront facing is a major plus and a significant differentiating factor for buyers looking to purchase for own stay. The environment of both The Tre Ver and Riverfront Residences is very good and amenities are nearby with The Poiz Centre and Hougang Mall nearby to the respective malls. Buyers may be attracted to the good schools near both these developments as well. St. Andrew’s Junior School is a popular primary school and The Tre Ver is within a 1-kilometre radius of the school. Likewise, buyers may be attracted to Riverfront Residences because of the popular Holy Innocent Primary School. If you are looking to purchase The Tre Ver as an investment property to rent out, you may find the rental market extremely challenging for your unit. There are many developments around Potong Pasir MRT Station. In fact, The Poiz Residences and Sennett Residences are located at the entrances of Potong Pasir MRT Station. If tenants wanted convenience, they would have options at these developments. Based on rental contracts concluded in June 2018, a 1 bedroom in Sennett Residence goes for between $2,200 and $2,300, 2 bedroom goes for $2,700, 3 bedroom $3,400 and 4 bedroom $4,500. There is going to be an influx of condominium units in the area with Poiz Residences. 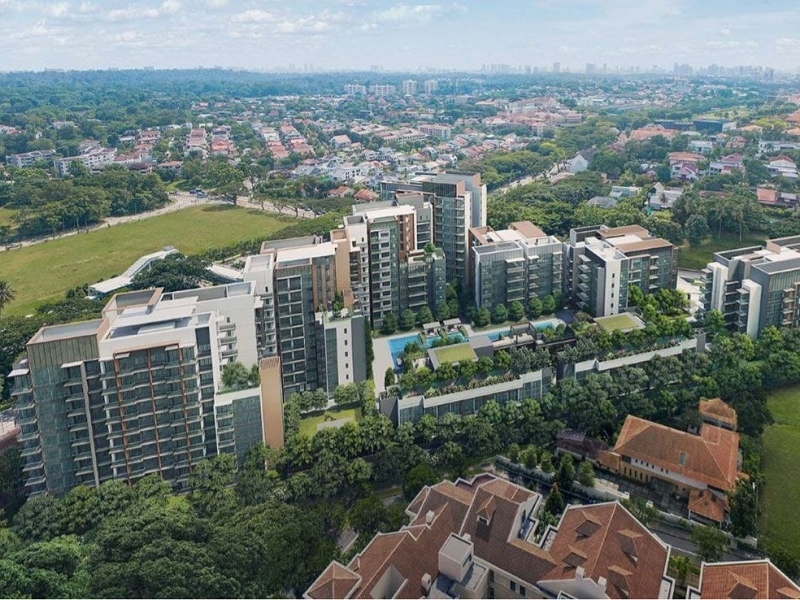 One MRT station away, The Woodleigh Residence, Park Colonial will be completed around the same period as The Tre Ver and over at Serangoon MRT Station, Forest Woods will be completed and units for rent will come onto the market soon. I have always advocated that if buyers are looking to rent out their property, they should buy next to the MRT station. There will be many developments completing in the near future, putting pressure on rents across Singapore. The number of competing condominiums around Riverfront Residences is significant as well. Riverfront Residences has to compete with developments like Midtown Residences, Evergreen Park, The Florida, Rio Vista, Kingsford Waterbay, Boathouse Residences, Heron Bay and Riversails. Only Midtown Residences and Evergreen Park are closer to Hougang MRT Station than Riverfront Residences. I would be concerned when Kingsford Waterbay is completed. There will be a large number of units in the area and these units were looking for tenants, there could be downward pressure on rental prices in the area. Looking at the rental contracts concluded in June 2018 for Midtown Residences, a 1 bedroom goes for $1,600 to $2,000, a 2 bedroom $2,200 to $2,300 and there was a 3 bedroom that was rented for $2,300 as well. It is clear that rental prices are not very high in this area and thus correspondingly, selling prices are lower. If you were to purchase a 1 bedroom at Riverfront Residences at about $600,000 and rent it out for $1,600, your gross yield would be about 3.2%. If you factor in maintenance fees and if you add the Additional Buyer’s Stamp Duty to the purchase, the nett yield should be less than 3%. There is also a risk of the property being left vacant if there is no tenant willing to rent the unit. Buyer already has one property. Buying a second property for investment and to collect rent. This scenario is plausible in many places across Singapore. Thus if buyers were to tell me that they want to purchase these developments to rent it out, this would not be the best place to put your money. Based on data listed on the URA’s website, a tenant rented a 3 bedroom unit at Midtown Residences for $2,300 in the month of June. Midtown Residences is the closest condominium to Hougang MRT Station and such figures do not bode well for other 3 bedrooms in the vicinity. One data that is sorely lacking is the number of months a unit takes to get rented. i.e. the number of months a unit is left vacant before it gets rented out. The time it takes for a unit to get rented out is progressively getting longer based on my experience as a real estate salesperson. However, if you are looking for a nice property to live in a matured estate with amenities, then The Tre Ver and Riverfront Residences look like decent, pleasant properties to live in. Once again, I cannot stress the uniqueness of having a development with a waterfront facing. I find current property prices expensive but if we were to use the recent launches as a barometer, then perhaps The Tre Ver’s starting per square foot pricing of about $1,462 is just about right. Prices should hover in the $1,5xx per square foot range and with Park Colonial going for as high as $1,8xx per square foot for certain units, The Tre Ver being about 10+% cheaper in terms of per square foot seems in line with current pricing. Potong Pasir is a very good neighbourhood to be in. 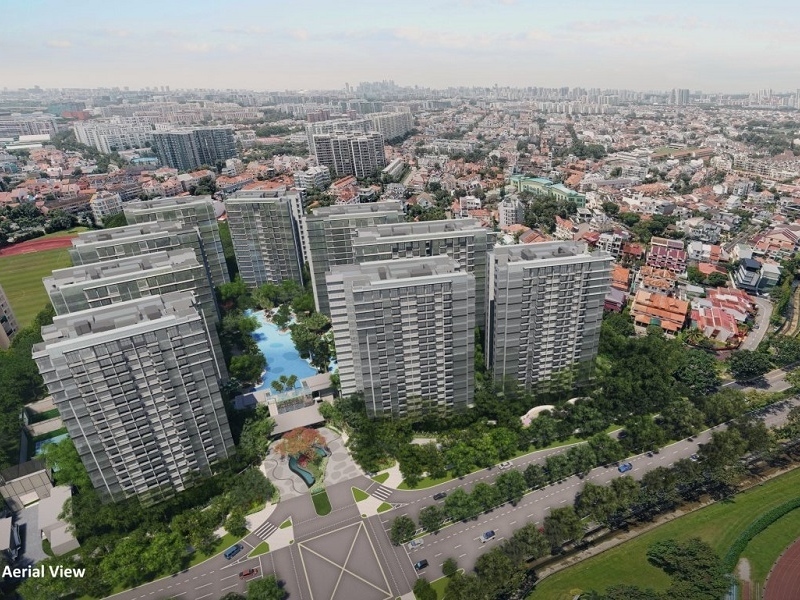 However, The Tre Ver is located about 800 meters from Potong Pasir MRT Station whereas other developments like The Poiz Residences and Sennett Residences are located right next to Potong Pasir MRT Station. 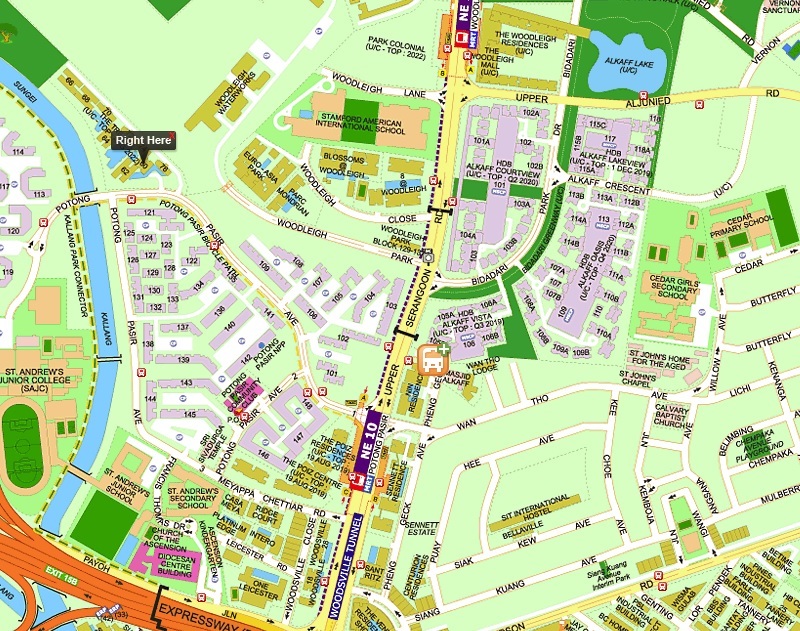 In fact, The Tre Ver is perhaps the condominium that is the furthest from Potong Pasir MRT Station in this vicinity. That being said, it is facing the Kallang River and has a park fronting it. This is a poor location if you are looking for a property to rent but a very nice property if you are looking for a property for your own stay. I really like UOL projects. Being in the real estate industry for a significant period of time, I would say that UOL developments are one of the better developments out there in terms of quality and finishing. These days there are no more new launches priced less than $1,000 per square foot. 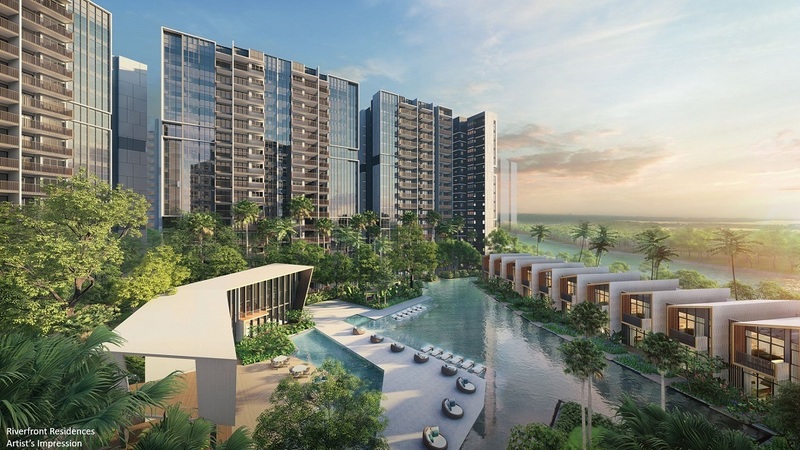 You can get units at Riverfront Residences at less than $1,200 per square foot which I think is extremely reasonable considering the fact that Affinity at Serangoon is priced in excess of $1,500 per square foot. Hougang is not a place to be fishing for tenants. Especially when there are many developments coming up. A similarly large development, Kingsford Waterbay, is just around the corner. Based on data extracted from the URA website, rents are really low for Midtown Residences, which is located very close to Hougang MRT Station. Thus, do not expect Riverfront Residences to be able to command a high rent. As a place to stay, Riverfront Residences is attractive. Facing the Serangoon River and still relatively well connected via the KPE, I would expect most buyers to be upgraders from around the area. The developers are experienced in development and construction. Personally, I do not find any issue with the developer profile of Riverfront Residences. Based on the design, it does look a bit similar to Affinity as Serangoon. I cannot meaningfully recommend both properties as an investment property if you are looking to rent them out. The tenant pool is really limited at Hougang and there are developments closer to Potong Pasir MRT Station. However, if you are looking for a property to live in, both properties are excellent properties. I particularly like the strata terraces in Riverfront Residences. 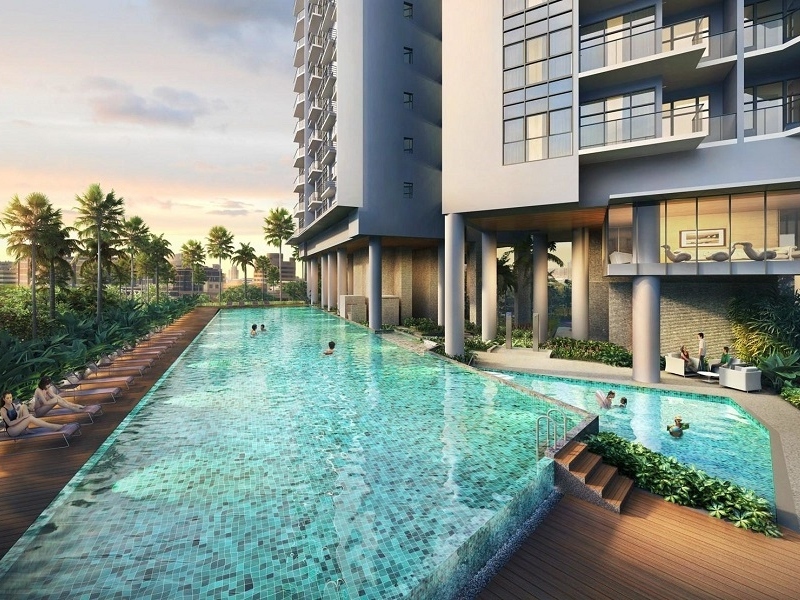 The front of the unit faces the swimming pool and the back faces the Serangoon River. The Tre Ver front the Kallang River and there is a nice jogging path and park along the river. The area is really serene and a very nice place to be especially in the evenings. p.s. I am a licensed real estate salesperson at the point of writing this review. My real estate agency is the marketing agency for both developments. My reason for writing this review is to share my personal view about the developments and hopefully share some insight to help buyers make a more informed buying decision. P.S. You can reference The Tre Ver floor plans here. P.P.S. You can reference the Riverfront Residences floor plans here. P.P.P.S. I have just started a YouTube Channel and I will be uploading weekly videos explaining the various investment terms and jargon which may come in handy for some. Do consider subscribing to my YouTube Channel for useful investment content videos. You can access my YouTube Channel here.